SCVHistory.com | CalArts | John Baldessari Studios Dedicated at CalArts, 3-10-2015. 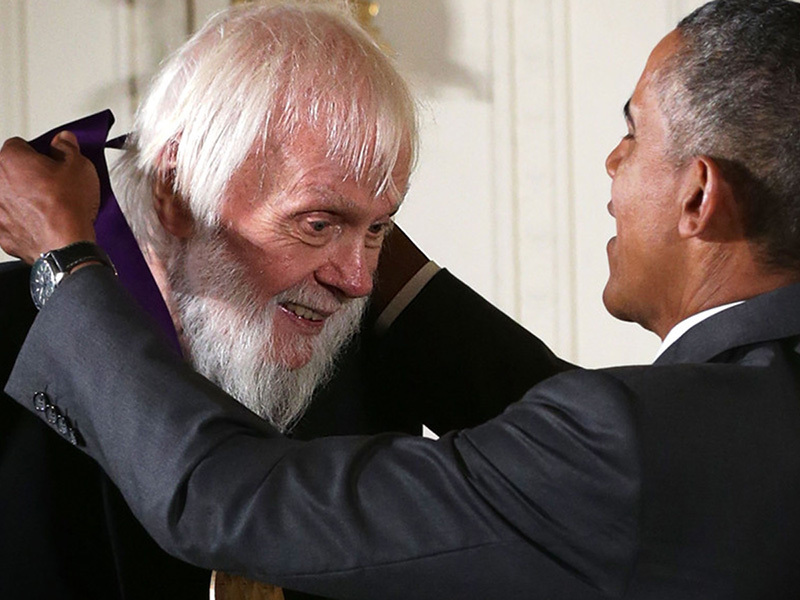 Artist John Baldessari stands in front of the newly dedicated studio building. Photo: Rafael Hernandez/CalArts. Click to enlarge. 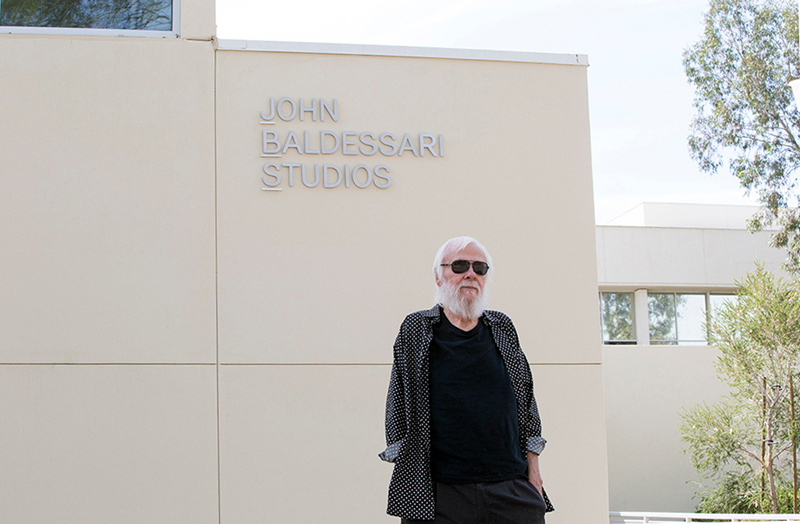 CalArts dedicated the new John Baldessari Studios on March 10 with a celebration that paid tribute to the building's namesake—the influential Los Angeles artist who helped establish an innovative education program that has produced many of the world's leading contemporary artists. Baldessari attended the event along with some of his former students, other artists and arts patrons who contributed to the $2 million fundraising effort for the building as well as student scholarships in the School of Art. CalArts President Steven D. Lavine noted that while there are museums named after artists and dedicated to their work, it's rare for an educational institution to name a building after a living artist. Lavine said that it made sense to name the building after Baldessari, not only because of the impact he had on the school when he was teaching at the Institute as a founding faculty member, but also because of the influence he will have on future generations of art students. "John's impact on students was profound," Lavine said, naming a long list of CalArts alumni whom Baldessari mentored, including Eric Fischl, Mike Kelley, Tony Oursler and David Salle. "John will remain an inspiration for years to come, and when we're all gone, his spirit will continue to pervade the art and lives of our students." CalArts Trustee Jill Kraus, co-chair of the CalArts Art Benefit & Auction fundraiser, said that the effort was unprecedented, including gallery exhibitions and sales and an auction at Christie's in New York last year of work donated by some of the world's leading artists. "No art school had ever attempted a fundraising model like this before." The Baldessari Studios building is a separate structure with a total of 7,500 square feet that includes 16 artist studios, an exhibition space, and a large light-filled painting room. Thomas Lawson, dean of the School of Art, said, "While we're driven here by ideas, students also make things. For years, our classrooms were all in dark, carpeted rooms, and part of my mission has been to get a studio classroom with concrete floors and natural light. So it's finally here." When Baldessari was asked to speak, he paid homage to one artist's project in the early 1970s that characterized the open-ended nature of art making that he has advanced. "Matt Mullican stood outside the building with a small mirror that reflected the sunlight onto a mirror held by another student that was then reflected onto another mirror and on and on into the building until a little spot of sunlight shined on a wall in the classroom," he said. "That gives you an idea of some of the fun we had." Many of the studios in the building are named after CalArts alumni, including Oursler, who was largely responsible for persuading other artists to donate their work in honor of Baldessari and to help CalArts. "I feel so connected to this school and what it's done for me and my friends," he said. "To see all of this flow into this architecture is wonderful. This space will allow people to be creative." 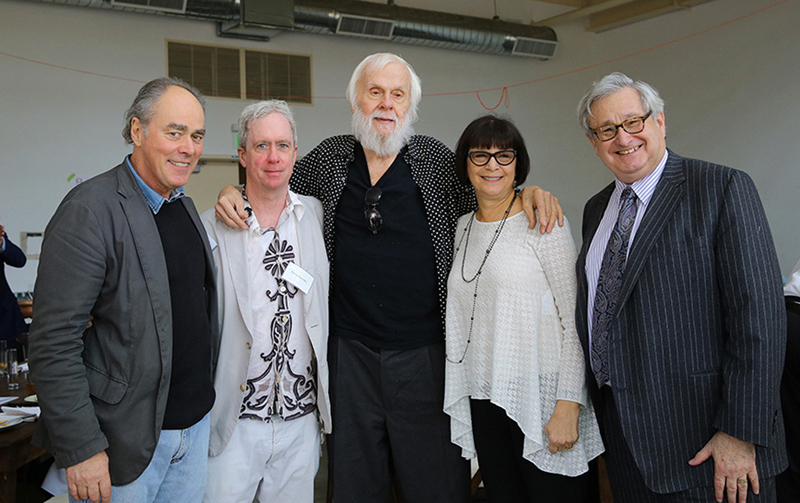 From left: School of Art Dean Thomas Lawson, CalArts alumnus and artist Tony Oursler, Chouinard alumnus, longtime CalArts faculty and artist John Baldessari, trustee Jill Kraus and President Steven D. Lavine. | Photo: Rafael Hernandez/CalArts. Click to enlarge. From The Broad Museum in Los Angeles (2015), where 40 works by Baldessari are part of the permanent collection. 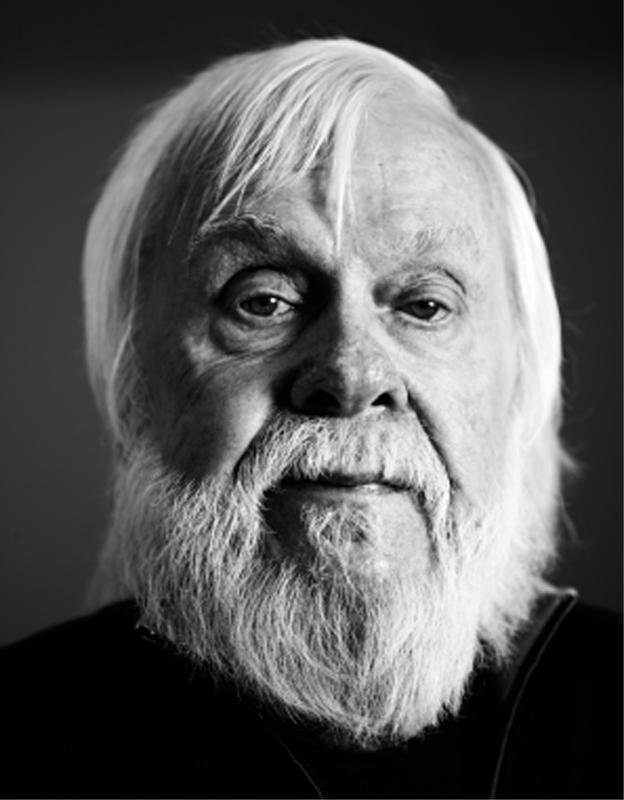 One of the founders and innovators of conceptual art, John Baldessari (b. June 17, 1931, National City, Calif.) has continued his exploration of the structure of artistic practice and visual thinking for close to sixty years. Photographs, text, and spots of color are the frequent starting points for his work, and these simple devices uncover the visual and ideological mechanics of how an artwork directs a viewer's eye and thoughts. However, the outcome is never dry: Baldessari always brings large dose of wit and humor providing often much needed levity and self-reflection to art in general. "The Spectator is Compelled...," 1967-68, was completed in National City, California, before Baldessari moved to Los Angeles. For the work, Baldessari posed for a photograph that was exposed directly to the canvas. The artist stands in the center of the scene, staring down a city street. The sides of the street mimic the sight lines of traditional painting perspective. In a gesture both comic and revolutionary, Baldessari quotes a composition textbook, telling the viewer what the photograph expects their eyes to do, "to look directly down the road and into the middle of the picture." Balsessari, separating the rules or hidden tricks of an image from the image itself, opened up a world of idea-based art. In "Seashells/Tridents/Frames," 1988, Baldessari assembled a grouping of five black-and-white photographs, cropped or partially covered, that have no obvious relationship to each other. In the rightmost image a cropped man "fishes" with a trident poised over still waters; to the left, a suited man presents ornate picture frames; and central left, a collection of seashells are on display in a cabinet. All serve as metaphors for the contemporary artist's search for choice images, as well as for the presentation, framing, and display of those images, and for the artist's self or identity. Seashells/Tridents/Frames is a contemplation of issues about art making that have fascinated Baldessari and propelled his work for years. In the more recent work "Noses & Ears, Etc. (Part Two): (Green) Face with Nose, (Yellow and Violet) Hands, (Red) Arm and Pistol (with Tie)," 2006, Baldessari continues his interest in often dark themes balanced with visual tricks and humor. A man, maybe a criminal or a hostage, is having his pistol taken away. The use of color and whimsy dissolves the potential threat of the weapon into a complex visual situation.